Originally given on 13 October 2013. EVERAL YEARS AGO when I was still living in the diocese of Lexington, KY, the priests there were asked to do a ‘pulpit exchange.’ This meant that one Sunday they were to preach at a different Church and tell the story of their priestly vocation. In other words how and why they happened to become priests. Now probably each priest’s story is different, and possibly way different. So all we could do was to tell it like it was for us. My journey, shall I call it, really began very early in life. I remember the first time that Sister took us to Church in the first grade, and explained to us how Jesus was present there: how He became present at Mass through the priest. When I heard that, the thought ran through my mind that maybe someday I too would like to be a priest to be able to do that. Now I’m not saying that I had this idea from then on out, but I can say that was the time that the idea first struck me. But then, as I recounted the story in my sermon I made perhaps an unfortunate, and in the opinion of some, an inappropriate remark. I said something to the effect that if that had been one of those churches where the Blessed Sacrament had been relegated to some side chapel or closet, that would not have happened. The Church in which I was preaching happened to be one of those Churches which didn’t have the Blessed Sacrament in it, and my remark caused quite a stir. I even received a call from the chancellor the next day that I shouldn’t express my personal opinions about things in my sermons. I simply told the chancellor that I was asked to tell how my vocation to the priesthood started, and that was the story of the beginnings of my vocation to the priesthood. I couldn’t change that. I can tell this story here at Old St. Mary’s because I don’t think the position of the tabernacle is going to be a source of controversy among you good people. 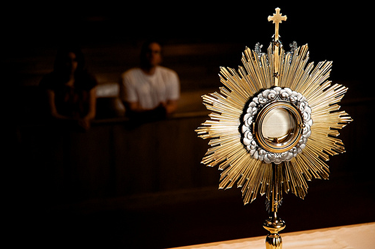 You want our Lord’s real presence in the Blessed Sacrament to be right in the center or most important place in the Church. I am sure you have one of the highest records of Eucharistic Adoration time in the entire Diocese. What you do is real ‘Faith in action.’ You show by your actions what you believe in regard to the Eucharist. You might not have the theological insight of a St. Thomas Aquinas, Fides quaerens intellectum, that faith seeking understanding. Yours is more the practical faith of St. Francis who insisted that the altar linens and furnishings be kept clean and spotless out of reverence for the King of Kings Who is present.